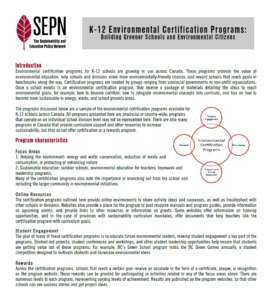 SEPN has collected data on uptake of several high level sustainability initiatives in all Canadian school divisions. Tab 1 includes institutional characteristics (e.g., language of instruction, presence of aboriginal/multicultural programming, school type, student population), Sustainability Initiative information (e.g., whether the school division has participated in a sustainability assessment or eco-certification, and whether sustainability-specific staff are present in the school division), and school division website link. 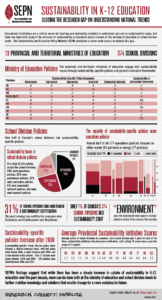 Tab 2 includes information on school division sustainability-specific policies and includes data identifying whether the policy adopted a whole schools approach (i.e., incorporated research, curriculum, community outreach, governance, and operations (including the type of operations mentioned in the policy). 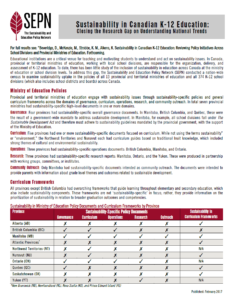 This spreadsheet also contains data on the terminology used by the policy (i.e., whether the school division used the terms sustainable development, sustainability, environment, or other to define sustainability) and the name and link to the policy examined by SEPN. The data in the following spreadsheet were collected in April 2016. If you wish to share information with us to update a school division’s entry (e.g., new information about policies, eco-certification status, links to policies), please email sepn.info (at) usask.ca.